The International Accounting Bulletin is the leading authority of the global accounting industry and The International Accounting Bulletin is the leading authority of the global accounting industry and regularly analyses firm performance and best practices. The 2013 IAB awards honor individual excellence, innovative practices and firms that have risen above their peers in the past 12 months. MSI was presented with the Association of the Year award during the awards ceremony held at the Institute of Chartered Accountants in London on 14th March. MSI was praised for effectively harnessing the use of innovative technology to connect with its global members having recognized the fundamental shift in the way in which professional firms, clients and stakeholders communicate. MSI has a presence in Northeast Ohio through its member firms Corrigan Krause and Weston Hurd. “The honor awarded to MSI is well-deserved. MSI has enabled our clients to compete internationally, saving our clients and our firm the valuable resources of time and money in the ever-growing global market. We have been a proud member of MSI since 1999,“adds Gary W. Johnson, Esq. of Weston Hurd LLP. Ranked in Crain’s Top 25 Largest Accounting Firms, Corrigan Krause was founded in 1992. It is a full service certified public accounting firm servicing northeast Ohio and beyond. 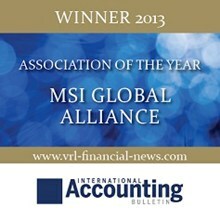 They are a member of MSI Global Alliance, an international association of independent legal and accounting professionals. With more than 55 attorneys and with offices located in Cleveland, Columbus and Beachwood, the law firm of Weston Hurd LLP provides comprehensive legal counsel to Fortune 500 companies, insurance carriers, banks, healthcare providers, small- and medium-sized businesses, the real estate industry, governmental agencies, non-profit enterprises and individuals. Weston Hurd is honored to be recognized by Martindale-Hubbell and ALM as a 2013 Top Rated Law Firm.